Looking for a Walk-In Shower in Seaside, OR? Independent Home Products, LLC has been proudly installing walk in tubs and walk in showers in Seaside, Oregon since 2007. For over 12 years we have been increasing our customers' bathroom safety and independence by installing walk in showers in Seaside. Our walk in showers are every bit as attractive as they are functional. What's more, when you call Independent Home Products, LLC to install your walk in shower, you'll receive superior customer care and an expert in bathroom safety. Give us a call today for a free walk in shower quote and you'll quickly see why we're the top choice for walk in shower installation in Seaside! When Installing a walk in shower in Seaside, several factors must be taken into consideration. Placement of drains and shower heads is crucial. If not installed ideally, problems with spraying water onto the bathroom floor can occur. Instead of making your bathroom more safe, water leaving the shower becomes a slip hazard. By installing a walk in shower that correctly directs water efficiently down the drain and placing shower heads where they will drain most directly, we'll prevent those problems. Placement of accessories is another consideration Independent Home Products, LLC will help you with. 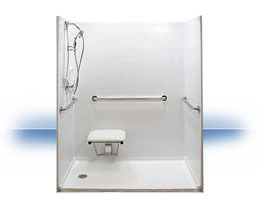 Whether you want a custom, molded seat built into your walk in shower, or plan to purchase a standard seat, we'll help you figure out correct placement of grab bars and shelves to hold shampoo, soap and other accessories. When it comes to affordable, safe and high quality walk in showers in Seaside, OR, Independent Home Products, LLC is the provider for you!